CupidOnFire may be oddly named, but it's purpose can be simply described. 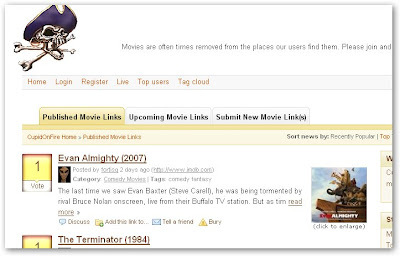 It lets users post and vote on movie links. Another way of putting it is that it's Digg for watching free movies online. Like Digg, you can submit links along with the relevant description and tags as well as vote and comment on stories. So unlike most other free movie sites, there's a lot of transparency about which links make it and which don't since the whole community gets to decide what's hot and what's not. However, the only problem with this model is the lack of a user community. So far, only about 30 links have been submitted, and the level of voting activity rivals that of MySpace News. Still, it's an interesting twist on the usual movie site, and there's still a chance for it to become viral.